Our Olympian series mats are nearly indestructible and create an ideal layer of protection for your expensive floors. The Olympian Safe Floor mat is most often found in warehousing and weight rooms, but can be practically anywhere. 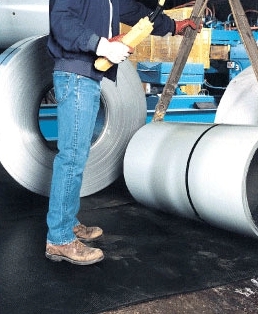 These mats work beautifully in areas of extreme temperatures, they show no visible cracking in -45 degrees Fahrenheit, and are staples in welding and metal-working areas. These mats are ideal for use where there may be forklift traffic and extreme conditions, or homes where you would like something that is built to outlast everything else on the market. Combination of nylon fibers and rubber blended to form a mat that lasts up against the most extreme conditions. Surface has a slip-resistant diamond pattern design for keeping everyone's safety. 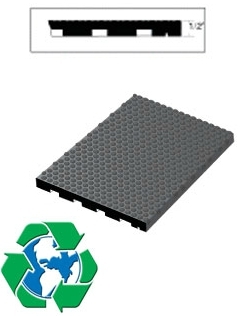 Olympian style mats are a green product, manufactured from recycled tire trim rubber. Olympian mats show no signs of deterioration at 400 degrees fahrenheit, nor issue with ozone exposure and weathering. Standard Sizes: 1/2" thick, sold in 4'x6' mats. OSF-12450 4' x 6' 46.0 lbs.